Research proposals from Laurie Boyer, associate professor of biology; Matt Shoulders, the Whitehead Career Development Associate Professor of Chemistry; and Feng Zhang, associate professor in the departments of Brain and Cognitive Sciences and Biological Engineering, Patricia and James Poitras ’63 Professor in Neuroscience, investigator at the McGovern Institute for Brain Research, and core member of the Broad Institute, have recently been selected for funding by the G. Harold and Leila Y. Mathers Foundation. 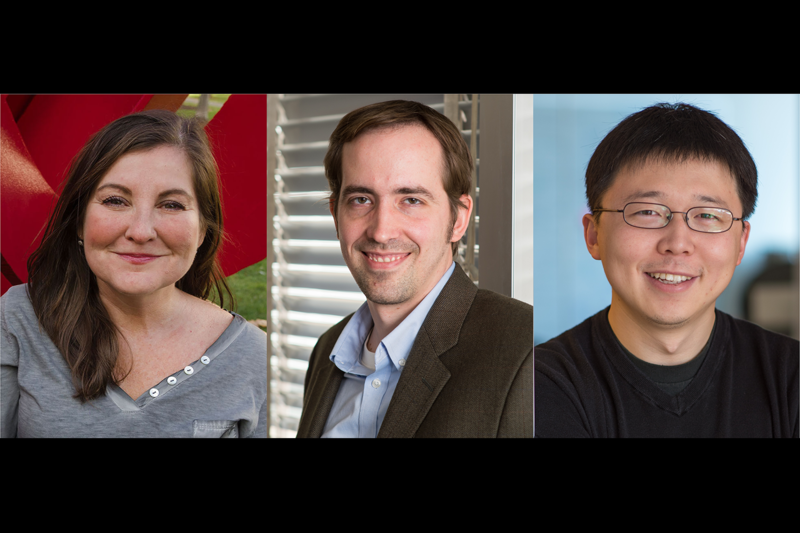 These three grants from the Mathers Foundation will enable, over the next three years, key projects in the researchers’ respective labs. Regenerative medicine holds great promise for treating heart failure, but that promise is unrealized, in part, due to a lack of sufficient understanding of heart development at the mechanistic level. Boyer’s research aims to achieve a deep, mechanistic understanding of the gene control switches that coordinate normal heart development. She then aims to leverage this knowledge and design effective strategies for rewiring faulty circuits in aging and disease. Shoulders’ goal, with this support from the Mathers Foundation, is to elucidate underlying causes of osteoarthritis. There is currently no cure for osteoarthritis, which is perhaps the most common aging-related disease and is characterized by a progressive deterioration of joint cartilage culminating in inflammation, debilitating pain, and joint dysfunction. The Shoulders Group aims to test a new model for osteoarthritis — specifically, the concept that a collapse of proteostasis in aging cartilage cells creates an unrecoverable cartilage repair defect, thus initiating a self-amplifying, destructive feedback loop leading to pathology. Proteostasis collapse in aging cells is a well-known, disease-causing phenomenon that has previously been considered primarily in the context of neurodegenerative disorders. If correct, the proteostasis collapse model for osteoarthritis could one day lead to a novel class of therapeutic options for the disease. Many genetic diseases are caused by the change of just a single base of DNA. Zhang is a leader in the field of genome editing, and he and his team have developed an array of tools based on the microbial immune CRISPR-Cas systems that can manipulate DNA and RNA in human cells. Together, these tools are changing the way molecular biology research is conducted, and they hold immense potential as therapeutic agents to correct thousands of genetic diseases. Now, with the support of the Mathers Foundation, Zhang is working to realize this potential by developing a CRISPR-based therapeutic that works at the level of RNA and offers a safe, effective route to treating a range of diseases, including diseases of the brain and central nervous system, which are difficult to treat with existing gene therapies. “The generous support from the Mathers Foundation allows us the freedom to explore this exciting new direction for CRISPR-based technologies,” Zhang stated. Known for their generosity and philanthropy, G. Harold and Leila Y. Mathers created their foundation with the goal of distributing their wealth among sustainable, charitable causes, with a particular interest in basic scientific research. The Mathers Foundation, whose ongoing mission is to advance knowledge in the life sciences by sponsoring scientific research and applying learnings and discoveries to benefit mankind, has issued grants since 1982.